The WPC Expo 2002 ran from October 16 to 19 in Tokyo, Japan. The organizers are claiming that the WPC EPXO is the biggest IT trading show in Asia. We took the opportunity to have a closer look at the upcoming DDR dual-channel mainboards based on nVidia’s “nForce 2” and Intel’s “Granite Bay” chipset. The upcoming ABIT DDR dual-channel products have already been covered here in our interview with ABIT's Scott Thirwell. USB 2.0, AGP 8X, 10/100 LAN and SATA support are now standard features. 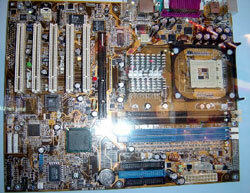 But, none of the displayed boards had Southbridge/ICH integrated SATA support yet. 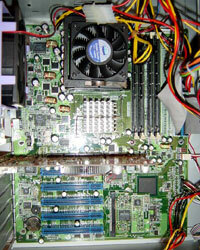 All are still using an independent controller chip which puts the SATA HDD behind the PCI bus. With optional SATA RAID and Firewire, 2 LAN ports, digital Dolby 6 channel and DDR 400 support, the nForce 2 based Asus A7N8X looks very attractive. All of the displayed Granite Bay mainboards came with integrated AC’97 6-channel sound only, none with an independent sound chip from C-media or Creative and only the ABIT GB7 is announced with serial SATA. 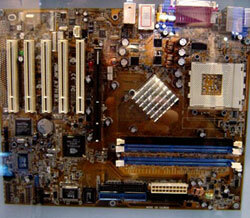 Only MSI had a Granite Bay board running at their booth, all other boards were just display samples. It seems that (as usual) Asus will be first out with their dual channel boards: the A7N8X will be available end of October and the P4G8X for Pentium 4 systems mid of November. 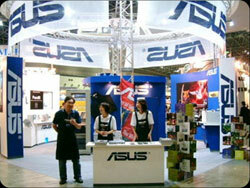 Asus also had the nicest looking booth! We heard several times that the upcoming Granite Bay chipset is quite touchy about memory quality. 2 absolutely identical DDR 266 memory modules are necessary. 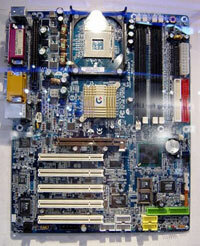 Although confirming substantial bandwidth gains with the upcoming dual channel boards quite a few exhibitors pointed at the upcoming Intel Springdale chipset (Q2 2003) with DDR 333 support and integrated SATA as the “real thing”.